I remember when The Poodles broke through in Sweden. The band had a big hit with their Eurovision Song Contest song “Night Of Passion” (co-written by Matti Alfonzetti of Impera and Skintrade fame). Because of that hit, their debut album Metal Will Stand Tall (2006), an uneven effort that didn’t contain much metal at all – we’re talking melodic hard rock here – became a pretty big success. Still, I know that I wasn’t the only one that gave the band two or three albums tops before they had to, what we thought, split up due to fading interest from the fans. There was also a whole lot of people in the hard rock community that laughed at the band, much to the fact that they had chosen one hell of a stupid name. Now, The Poodles has released album number six, they still have hits and they tour regularly and the band is without a doubt a force to be reckoned with and is now more or less a Swedish institution, so man, were we wrong. Some people might still laugh, but The Poodles laugh even harder. I say it every time this band releases an album and I will say it again; this band would have been given much more credibility had they chosen a better name – The Poodles is a lame name that gives the band some ridicule, but if people just paid attention to the music and realised that the name is secondary, both band and audience would have a win win situation. It kind of says something if you’re willing to diss a band just because of the name, if you refuse to listen to them even though they’re good just because the name is stupid. It says that you’re probably not that interested in music in the first place. I like The Poodles. Not every album, but most of them. The follow up, Sweet Trade (2007) was really good, Clash Of The Elements (2009) was again uneven, but both 2011’s Performocracy and their last album Tour De Force (2013) were really, really good – the latter was a really heavy piece of work – and as a live band, the band is not only a wall of sound, they are also very entertaining to watch. Add to the fact that the guys are a bunch of brilliant musicians, then you’ll know that the ridicule really doesn’t do them justice one bit. The Poodles were also the first band ever containing two guys named Pontus, Norgren (guitar) and Egberg (bass). But today they have none. Norgren left in 2008 to join Hammerfall and last year Egberg left to join King Diamond. Henrik Bergquist (guitar) and Johan Flodquist (bass) joined vocalist Jakob Samuel (ex- Yale Bate, Talisman, Jekyll & Hyde) and Christian Lundquist (drums) for the ride. They open the album just like I had expected them to – brilliantly. “Before I Die” is a riff happy, extremely catchy rocker and I’m not sure if this is the type of song you release as a single, but to my ears, this is a hit! “House Of Cards” that follows is a traditional melodic rock tune, but somewhere in there I get a retro feel, the kind that you get from a Richie Kotzen solo album, which makes the song twist in a cool way. First single “The Greatest”, however, is a bagatelle and not the greatest by any means. It’s a half-ballad, decent, but very predictable. Definitely a song I could do without. “Crack In The Wall” is an awesome track, though. A catchy rocker with song killer hooks, that I also see as single material to me. “(What The Hell) Baby” breaks the mold big time. The song has a beat close to disco, but the song’s backbone is hard rock. It sounds like Sixx A.M. has been the inspiration for the melody and it’s one of the best songs on this album – brilliant stuff. If you don’t surrender to the chorus of “Everything”, you can’t tell a hit when you hear one. This is melodic hard rock at its best and this NEEDS to be released as a single – it has HIT written all over it. “Stop” dips a bit, though. The song has a heavy riff and so far, so good, but unfortunately the arrangement is a bit too cheesy for comfort. It’s an ok song, no more, no less. “Need To Believe” however, is a real killer. Take Europe circa 1988 and add Led Zeppelin’s “Kashmir”. Get the idea? Does that sound like a cool thing? It is. The song is bloody marvellous and maybe the best track on the entire album. “Alive” has some cool heavy riffing, both heavy guitars and synthesizer riffs are catchy and so is the refrain. Good song. “Life Without You” has a riff and a groove reminiscent to Mustasch’s “Double Nature”, but other than that, the song is forgettable. The album’s both ending tracks “Creator And Breaker” and “Borderline” are good songs that sounds like standard Poodles-tracks, but neither of them are awesome. I don’t go all skip button on them, but they don’t get my pulse up either. As a whole, this is a really good album, but unfortunately, it wears off a bit towards the end. That said, the album doesn’t contain any bad tracks, but my days would have gone by perfectly even if “The Greatest” was never recorded. It’s not as heavy as its predecessor, but it’s not a softie either. Some people call The Poodles AOR, but I disagree big. 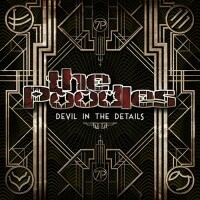 The Poodles are a hard rock band, albeit from the melodic school and they sure knows how to write great hooks and catchy melodies. Compared to their other albums, I rank this their number two after Tour De Force. It’s such a shame that their name has ruined so much for them because these guys deserve so much more. So let’s just put it this way, for open-minded rockers who wants an hour – give or take some minutes – of great rock music, this is an album you can easily sink your teeth into without any fear of regrets. For the rest of you who are too cool for this band, it’s your loss. I don’t know about you, but I prefer great music before coolness. That’s why I have this album.